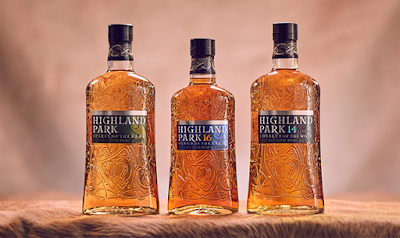 Highland Park, has announced the launch of the first four bottles in a new travel retail series, which take their names and inspiration from animals that held iconic status for the Vikings. Highland Park - Spirit of the Bear (40% ABV) primarily matured in sherry-seasoned American Oak casks. Highland Park 14 Year Old - Loyalty of the Wolf (42.3% ABV) matured in a combination of sherry-seasoned American oak casks and ex-Bourbon casks. Highland Park 16 Year Old - Wings of the Eagle (44.5% ABV) matured in both sherry-seasoned European and American oak casks. Highland Park 18 Year Old - Viking Pride Travel Edition (46% ABV) matured primarily in sherry-seasoned European oak casks. This new collection, which also sees the re-introduction of age statements as well as new packaging, draws inspiration from animals that held iconic status for the Vikings. Highland Park’s island home of Orkney, belonged to a vast Viking kingdom for over 600 years and this influence continues today with the whisky being made by modern day descendants of Vikings. Created by Master Whisky Maker Gordon Motion, each expression in the collection is said to showcase different aspects of Highland Park’s distinctive flavour profile and natural, cask-driven colour. Consumer navigation is aided by range graphics on the back of each pack as well as clear flavour descriptions for each product. Highland Park - Spirit of the Bear, Highland Park 14 Year Old - Loyalty of the Wolf, Highland Park 16 Year Old - Wings of the Eagle and Highland Park 18 Year Old - Viking Pride Travel Edition, will be rolling out across travel retail from this month, and available for the respective RRP’s of €50,00, €65,00, €90,00 and €110,00.